Diplomats in Vienna say they have begun drafting the text of a final comprehensive deal to settle the dispute over Iran's nuclear activities. But the Iranian foreign minister says key issues remain "unresolved". It follows five days of talks between Tehran and the so-called P5+1 - the US, UK, France, China and Russia plus Germany - in a bid to meet a 20 July deadline for the deal. EU officials say the next round of talks is due to take place on 2 July. "We presented each other with a number of ideas on a range of issues, and we have begun the drafting process," a spokesman for EU foreign policy chief Catherine Ashton said after the fifth round of talks ended on Friday. Iranian Foreign Minister Javad Zarif said they had come close to an agreement on the general framework for a comprehensive deal. "Still, we have not overcome disputes about major issues," he told reporters after negotiations in Vienna wound up. Image caption Javad Zarif says he is urging the P5+1 to "abandon excessive demands which will not be accepted by Iran"
"There has been progress, but major disputes remain," the Iranian foreign minister added. The P5+1 countries are hoping to secure a deal by 20 July that will permanently scale back Iran's sensitive nuclear activities to ensure that it cannot assemble a nuclear weapon. But Iran says its nuclear work, which it insists is peaceful, will continue - and wants an end to the sanctions that have crippled its economy. Meanwhile, the head of the US delegation, Wendy Sherman, said it remains "unclear whether Iran is really ready to take all the steps necessary to assure the world that its nuclear programme is, and will remain, exclusively peaceful". Separately on Friday, UN watchdog the International Atomic Energy Agency (IAEA) released a report saying that Iran has acted to eliminate virtually all of its most sensitive stockpile of enriched uranium gas. 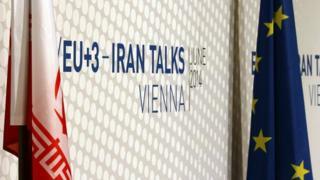 Iran is continuing to abide by the terms of last year's interim deal, the report added. The negotiations can be extended by up to six months beyond the 20 July deadline, but both sides are aiming to strike a deal by this date.